A scene from The Barber of Seville. 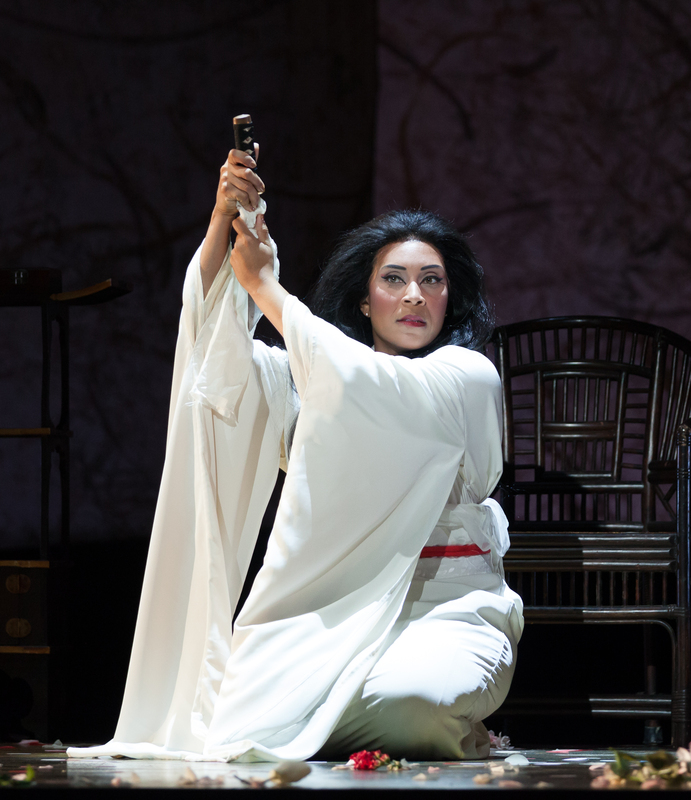 Photo courtesy Kentucky Opera. It is not hard to understand why The Barber of Seville is a staple within the Opera repertoire. Besides the elegant bel canto singing, there is the comedy, hijinks, and a love story. Doesn’t that sound like a great movie? Director Matthew Ozawa turns the stage of The Brown Theatre into a Hollywood-esque sound stage complete with plywood boards and elevated stage lights in the background and a director and camera crew filming the action up front. A neat idea to be sure and one could see where some of his inspiration came from the infamous Frederico Fellini. While Mr. Ozawa’s staging of The Barber of Seville wasn’t as surreal as Fellini’s film 8½, you could certainly see where the two stories converged: both the film and the opera have a class struggle, wishes for love seemingly beyond reach or means, and a strong, wily and independent woman. While in the marketplace, the young Count Almaviva (John Irvin) instantly falls in love with Rosina (Megan Marino). Having learned that she is the ward of Dr. Bartolo (Dale Travis), he instructs his servant Fiorello (John Tibbets) to gather a group of musicians together and serenade Rosina undercover of the night. While the troubadours play, Rosina makes her way to the balcony (in a lovely mid-century nightie) and drops a note asking the name of her suitor. Disguised as the poor student Lindoro, the Count introduces himself. A short time later Figaro (Will Liverman), Seville’s barber and self-proclaimed matchmaker (“Largo al factotum”), comes along and recognizes his former employer. 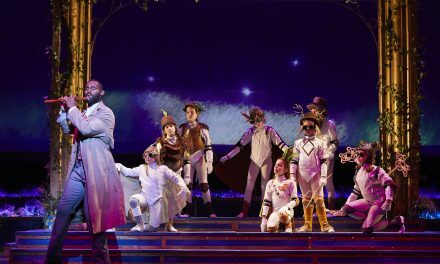 Figaro assures the Count that with his help, he will be able to win the fair Rosina’s heart and hand. Almaviva is all too happy to accept Figaro’s offer, but of course, not without a price. After learning that Bartolo wants to marry Rosina, Figaro suggests that Almaviva take on a new disguise: a drunken soldier who has orders to be lodged at Bartolo’s house. While Figaro and the Count are plotting, Rosina makes it known that her heart is Lindoro’s as she writes him a note stating so in the famous aria “Una voce poco fa”. Just as she leaves, Bartolo and Rosina’s singing teacher Don Basilio enters the room discussing the rumor that the Count has plans on making Rosina his wife. The two hatch a plan to slander the Count (“La calunnia è un venticello”) to help get him out of the way. Upon learning of the Count’s intentions, Bartolo declares his interest for Rosina. During this time, Figaro is hiding in the drawing room. As Basilio and Bartolo leave the room, Rosina enters and Figaro asks her to write a note of encouragement to Lindoro that he may deliver, which of course she has already done. Just then Almaviva, disguised as the drunken soldier, arrives at the door and forces his way in. The two lovers recognize each other and do their best to remain calm. Bartolo insists that he is pardoned from having to house any soldiers and a loud disagreement ensues, so much so that it draws complaints from the neighbors and the police are called. It is within this extended finale of Act I that some great vocalization, Figaro’s “Fredda ed immobile, come una statua” and the quintet “Mi par d’esser con la testa in un’orrida fucina; dell’incudini sonore l’importuno strepitar.” I liked the staging and direction that Mr. Ozawa used for this section as it has comedic bones within it as well as a bit of social commentary. After the uproar Dr. Bartolo reluctantly allows Don Alonso (the Count again disguised), substituting for an “ailing” Don Basilio, to come in and instruct Rosina. Again, the two recognize each other and plot out clever ways to draw closer to one another, while Bartolo keeps a close eye, despite falling asleep as Rosina sings her favorite aria from the opera The Useless Precaution. Figaro arrives to give Bartolo his shave. Despite Bartolo’s defiance to have his shave at that time, Figaro convinces him but Bartolo will only do so if Figaro can do so in the same room while Rosina receives her lesson. As Figaro is prepping Bartolo he manages to steal a key that will allow the Count and himself to come back to Bartolo’s house and retrieve Rosina, who is now locked within the house. As Bartolo is about to receive his shave Don Basilio enters the house and it takes a lot of convincing and all of the money in the Count’s pockets to convince him to leave as a sick man (“Don Basilio! – Cosa veggo!”). The lovers are overheard by Bartolo of their plans and he quickly kicks the Count and Figaro out of the house and summons Basilio to retrieve the Notary promptly so that he may marry Rosina right away. I appreciate when an opera and/or theater company looks outside their comfort zones for new ways of presenting what are considered “war horses” of repertory. The Barber of Seville is certainly one of those, being one of the top 10 operas that are in constant rotation. I truly appreciated the thought and energy that went into Mr. Ozawa’s presentation but feel that it fell flat a few places. It begins with the idea Kentucky Opera did something very similar at the beginning of the season with their presentation of Ariadne auf Naxos, where we watched the backstage of the opera. I’m sorry, but I didn’t see much difference between the two. Another issue that I saw is that I was not completely sold that the whole of the production was grounded in the mid-1960s. Was the use of wireless headphones for stage managers in use at that time? If they were, there should have been a transistor radio nearby. What about the break-dancer in the satin jacket that looked closer to the 80’s than the 60’s? I don’t remember those dance moves being too common during that time period. 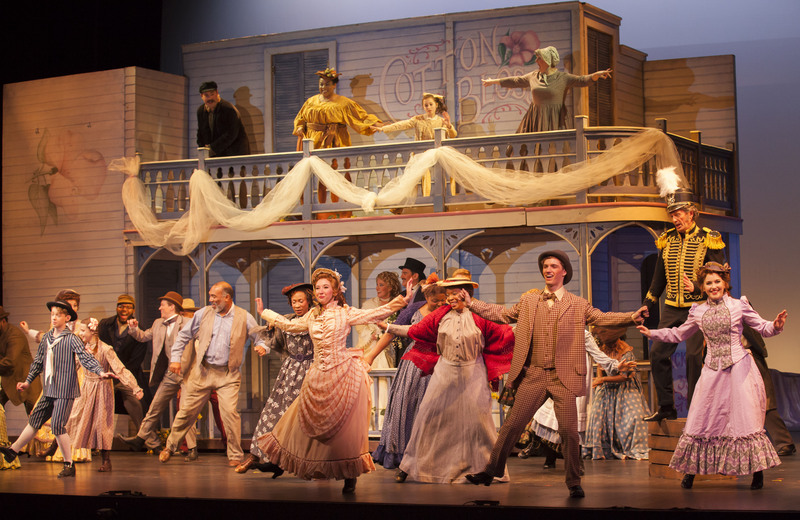 The scene design, custom made for this production by Andrew Boyce, fit perfectly within the realm of the small stage that is the Brown Theatre and was aesthetically pleasing for The Barber of Seville. I would like to know where the idea came from to use Romance Novel tableus for pictures strewn throughout Bartolo’s house. Did the doctor have a peccadillo with that type of book? I thought that was a bit of cheeky fun. All in all, I felt that Sally Dolembo caught the essence of the 60’s within her costume design, save for costuming for some of the supernumeraries. Her choices for Rosina were absolutely charming and very mod, especially the naughty nightie. 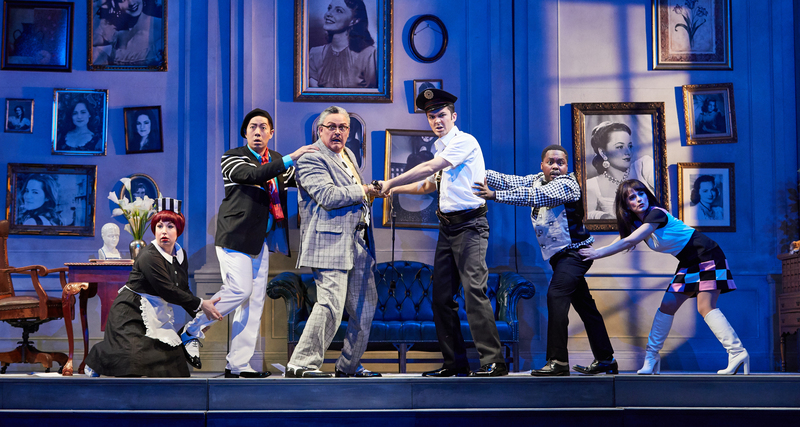 I can honestly say that this is one of the best ensembles that Kentucky Opera has assembled in recent memory. To be a performer, an opera performer, it takes more than just having a booming voice; you have to be able to act as well. With comedies such as The Barber of Seville it takes a little more effort and I am happy to say that this troupe made it look easy. Despite only having a few lines of music, when John Tibbets’ Fiorello began singing my face lit up. What a mature voice for someone so young. I can only imagine where you may be going. Similarly, I have been enjoying watching Clara Nieman’s opera career build upon the foundation of graduation from the prestigious Eastman School of Music and participating in Kentucky Opera’s Young Artist Program. Her Berta for this production was delightful and offered her a chance to let her hair down a little bit. As soon as I heard Adam Lau as Basilio utter his first phrase I thought to myself, I bet he’d make a great Mephistopheles (It seems he has). With a distinguished basso, clear resonance, and delightful comedic reactions, he played Bartolo’s sidekick to the hilt. Speaking of Bartolo, bravo to Kentucky Opera for acquiring veteran singer Dale Travis for this role. His impressive vocal range and knowledge about comedic opera were well suited for the role of Bartolo ad he commanded attention every time he was onstage. When he went into falsetto he had the audience in stitches. Despite the title of the opera being The Barber of Seville, the lion’s share of music and arias goes to the lovers: Almaviva and Rosina. Again Kentucky Opera struck casting gold with John Irvin and Megan Marino. Mr. Irvin was absolutely delightful as Almaviva, bringing to stage energy consistent with that of a love-sick young man, not to mention a warm and inviting tenor that shines light into the character of the Count. There are not many times that a Mezzo-Soprano gets the “man” in the opera world, not to mention that she gets to play the leading lady, but Rosina is one of those few instances. Although Rossini had originally written the role for a contralto, it is now often performed by a lyric mezzo-soprano and Ms. Marino was firing on all points. Looking like Hollywood glamour and portraying Rosina as a spirited, opinionated, and independent woman, Ms. Marino added even more appeal to her character through her ability to sing through the acrobatic circus of accidentals and incidentals that are strewn throughout the score with clarity and purpose. While I felt she played it safe with “Una voce poco fa” in its closing, it didn’t distract from her stunning vocal presence and prowess. The title character of Figaro, as you can imagine, has to be versatile and convincing. Will Liverman certainly lived up to that expectation and more. His “Largo al factotum” was quick-witted and fast-paced with fun choreography (by Matt Ozawa) and a wink and a smile. His ability to match his buttery baritone to the hijinks of the story was a delight. As Robert Tweten directed our Louisville Orchestra in the all-too-familiar opening of The Barber of Seville, (made popular by Bugs Bunny), I felt that there needed to be a little more brightness from the instrumentalists. I think that Mr. Tweten recognized that as well and it was quickly corrected and a brilliant performance resulted, even when the only accompaniment was the harpsichord. I was happy to have The Barber of Seville to close out the 2017-2018 season as a testament that great opera and great singing are still here and very relevant. They allow you to suspend belief for a while and luxuriate in a voice and/or instrument and laugh at the antics that play out on stage and perhaps leave the theater feeling a little bit better about the world outside.